WHAT: 7th Annual ACM® Lifting Lives® Music Camp, a week-long residential program open to campers nationwide, talented in music, with Williams syndrome. The Camp has a dual purpose of studying Williams syndrome while providing music enrichment through performance and education. ACM Lifting Lives funds the costs of the Camp, enabling the Vanderbilt Kennedy Center for Excellence in Developmental Disabilities to advance its mission of improving the lives of individuals with Williams syndrome and their families through research, training and service. WHO: Stars volunteering time to participate include Maren Morris, Eric Paslay, RaeLynn, Carrie Underwood, Maddie & Tae, Montgomery Gentry, Rascal Flatts and songwriter/producer Ross Copperman. 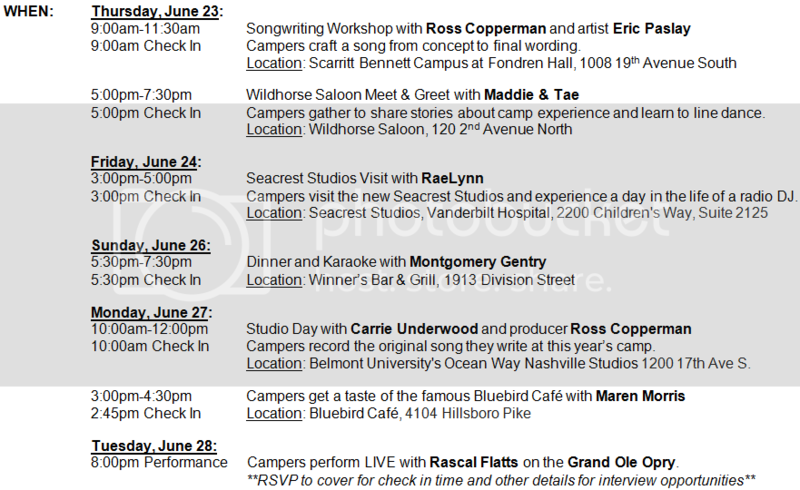 MEDIA RSVP: To inquire about covering any of the ops listed above, please email Brooke Primero brooke@acmcountry.com and Melissa Moldovan at melissa@acmcountry.com. MORE: In 2010, ACM Lifting Lives began fully funding what was previously called the Vanderbilt Kennedy Center Music Camp. Today the ACM Lifting Lives Music Camp serves approximately 30 campers with Williams syndrome from around the country. Williams syndrome is a genetic condition that is present at birth and can affect anyone. It is characterized by medical problems, including cardiovascular disease, developmental delays, and learning disabilities. These occur side by side with striking verbal abilities, highly social personalities and an affinity for music. For more information, please visit www.ACMLiftingLives.org.